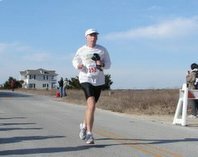 runjoey: Who is this guy? Who is this guy you ask? Believe it or not, that is yours truly. If you look at the TV(definitely not cable-ready) it is Kentucky Derby Day. The year was 1977. Less than two months after this was taken I cut my hair and started running. 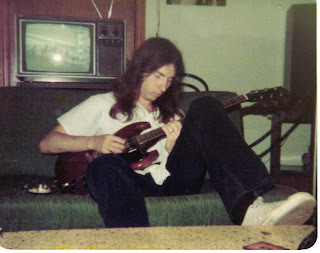 The guitar is a Gibson SG Special I bought in 1974. It is my most valued possesion although I have recorded all my songs on my newer Stratocaster. Ok, those of you that were curious about the young Joey, here is your evidence. I will not divulge any stories from that time period though. I'm not sure what the statute of limitations may be on some of my deeds. Can you play Stairway to Heaven?